China released a panoramic view of the far side of the Moon today taken by its Chang’e-4 spacecraft. Chang’e-4 is the first spacecraft to land on the lunar farside. While orbiting spacecraft from several countries have taken thousands of images, this is the first panorama from the surface. Chang’e-4 landed on January 2 Eastern Standard Time (January 3 in China) and sent back a photo of its Yutu-2 rover after it rolled onto the surface. A photo taken by Yutu also was released showing a small crater no far away. The spacecraft landed at 177.6 degrees east longitude, 45.5 degrees south latitude in the Von Kármán crater, part of the Moon’s South Pole-Aitken Basin. Although the far side is often mistakenly referred to as the “dark” side of the Moon, it is no more dark than the near side that is visible for Earth. Both sides get 14 days of sunlight and 14 days of darkness. The far side always points away from Earth, but it is not “dark.” When the near side is in darkness, we call it a New Moon. When it is in full sunlight, we call it a Full Moon. In between there are various phases. The far side has the same phases. China kept Chang’e-4 in orbit waiting for the Sun to rise on the far side before conducting the landing. Afterwards the spacecraft was powered down during the brightest and hottest part of the lunar day. It now has resumed its work. This is the view from the deck of the Change’4 lander. Panoramic view of the lunar farside taken by a camera on China’s Chang’e-4 lander. 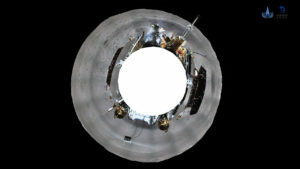 Spacecraft equipment is seen around the hole in the center (where the camera is located) in this 360-degree “ring view” with the grey lunar surface beyond. Credit: CGTN. 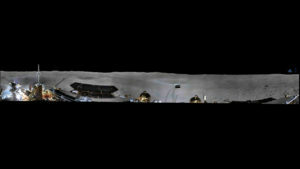 Panoramic view of the lunar farside taken by a camera on China’s Chang’e-4 lander. Spacecraft equipment is in the foreground with the grey lunar surface beyond. Credit: CGTN. The near side of the Moon has been visited by many U.S. and Soviet landers and rovers, including six U.S. Apollo crews who explored the surface from 1969-1972. China landed the robotic Chang’e-3 spacecraft with its Yutu rover on the near side in 2013. One of the reasons no country has sent a probe to the far side before is because a communications relay satellite is also required. There is no line of sight from the far side to Earth. China launched the Queqiao relay satellite in May 2018 that is in a special type of lunar orbit where it can always see Chang’e-4 and mission control on Earth and relay signals between them. The U.S. Lunar Reconnaissance Orbiter (LRO) has been orbiting the Moon since 2009. China Daily reported today that the China National Space Administration (CNSA) has been working with NASA for several months to ensure that LRO will be able to image Chang’e-4 and Yutu-2. It said this is the first cooperation between the two space agencies since 2011 when a law was passed in the United States prohibiting bilateral space cooperation between NASA and China. The so-called “Wolf Amendment” included in NASA appropriations bills does sharply restrict NASA’s bilateral cooperation with China. Exceptions are allowed, however, if Congress is notified in advance and certain certifications are made.